In Korean Preaching, Han, and Narrative, the main point of Sangyil Park makes is that “Korean narrative preaching demands such an artistic, transformative, imagination to bring a healing and transforming effect to the han-ridden minjung in Korean culture (70).” In other words, he proposes Korean narrative preaching as an alternative to kerygmatic preaching in order to resolve the Korean minjung’s han. Eventually, his argument for Korean narrative preaching is the outcome of synthetic and theoretical dialogue with han theory, minjung theology, historical Korean narrative studies, and North American narrative homiletics. Toward constructing a Korean narrative preaching, Park, in chapters one and two, examines theoretical interactions between han and minjung theology in traditional Korean society. He contends that the main goal of minjung theology is healing the minjung’s han; the minjung’s ontological experience is the hermeneutical key for interpreting the Bible subjectively (22); minjung theology correlates minjung stories with the Gospel, instead of church dogma or the transcendent God, in order to interpret God’s salvific act (2). In chapter three, Park examines the Chunhyangjun. Formulated in the Chosun dynasty of the eighteenth century Chunhyangjun verifies the potential of narrative preaching for Korean Christianity. Chunhyangjun was a pansori art and a Korean traditional narrative created by shamans who used imagination to both aesthetically heal minjung han and envision an alternative world (75). He notes that Chunhyangjun plot follows a typical Aristotelian model of plot: “Conflict-complication-peripeteia-denouement (139).” He inquires to see if Chunhyangjun uses effective devices to create catharsis as an aesthetic experience in a psychological manner and then envisions it in a new order; plot, humor, metaphor, imaginative and transformative language, satire, narrative, and poem, etc, like Western narrative preaching. Chapter four is his critique of North American narrative preaching and its theory. 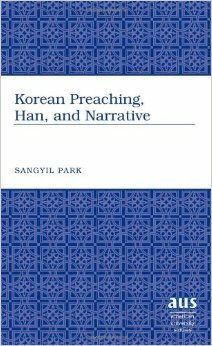 In Chapter five, Park presents his own Korean narrative preaching with his six inventive proposals. In my view, the strength of Park’s research is his analytical research on Chunhyanjun to synthesize a Korean narrative and Western storytelling homiletic for the sake of a Korean narrative preaching. Moreover, Park’s suggestions on Korean narrative preaching in Chapter five are valuable. This is because his narrative preaching as contextual preaching demands the preacher’s critical theological exegesis of minjung stories and the stories of the scripture, and fitting them into the Korean cultural, sociopolitical, and historical context (33). In addition, beyond the general criticism of North American narrative preaching (i.e., absorbing listener’s attention to preaching), his preaching pursues recovery of the whole being’s dignity through healing and inspiration of the minjung’s participation in God’s ongoing redemptive praxis for an alternative world. Overall, I am convinced that his research is splendid and noteworthy in homiletic theory for the Korean church and society as well. Thus, I want to suggest this book to other ethnic homileticians (including Korean homileticians) who want to contrive their own homiletic theory through theoretical interlocution with Western homiletics, their own traditional heritage and theology. I hope that the creative work in homiletics of diverse minority groups will make academic homiletic dialogue more abundant. Furthermore, specific ethnic (cultural) groups’ homiletics, by challenging Western homiletics, will be the main discussion topic in the homiletics area in the near future.